Chorizo is a popular spiced pork sausage that comes in two main varieties: Spanish and Mexican. 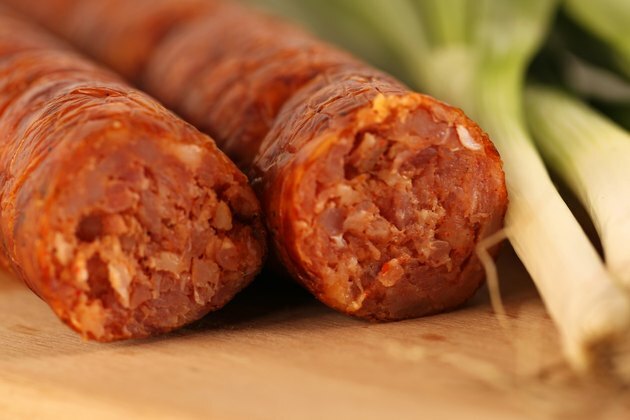 Spanish chorizo is dry-cured and doesn't require cooking. Mexican chorizo, however, is fresh pork that does. Many recipes call for chorizo to be cooked on top of the stove; however, it's just as easy to bake it in an oven. Combine pork, chili powder, red wine vinegar, oregano, garlic, paprika, cumin, salt and pepper in a mixing bowl. Work the mixture with your hands until the seasonings and vinegar are evenly distributed with the pork. Form into 4-inch-long rolls or 1/4-lb. patties. Each should be sized well enough to fit into a hot dog or hamburger roll. Place the chorizo on the baking sheet, cover with plastic wrap and refrigerate for at least three hours. Coat the baking pan with a non-stick spray. Remove the chorizo from the refrigerator, and place each link or patty into the baking pan. Put the pan into the oven. Turn the chorizo after the bottom browns to prevent burning. Cook for approximately 30 to 45 minutes or until a meat thermometer inserted into the thickest part of the patty or link reads 165 degrees Fahrenheit, the safe cooking temperature for pork. Remove the baking pan from the oven. Cut open one of the chorizo links or patties to ensure the center is no longer pink. Sausage dries easily in an oven. Monitor its internal temperature to ensure it stays moist. Add a quarter cup of water to the baking pan if the chorizo starts to burn on the bottom. Always wash your hands when handling raw meat.